To prevent corneal dryness and ulcerations, artificial tear drops should be used every hour while awake and ointment should be used at nighttime. On occasion with severe paralysis, a gold weight may be surgically implanted in the upper eyelid to allow closure of the eyelids. The gold weight is heavy enough to allow closure and protection of the cornea, but light enough so that it will not impede vision when the eye is opened. The treatment of Bell's Palsy is filled with debate and controversy. It should be remembered that 84% of patients with Bell's palsy have normal or near-normal recovery spontaneously without any treatment. It is the 16 % that will have moderate to poor recovery that we are trying to help with treatment. It is widely believed that the use of steroids to reduce inflammation within the nerve and an antiviral agent called acyclovoir or its derivatives may hasten and improve facial nerve recovery. When there is complete paralysis within three weeks of onset, it is useful to perform an electrical test called an electroneuronography (ENoG). 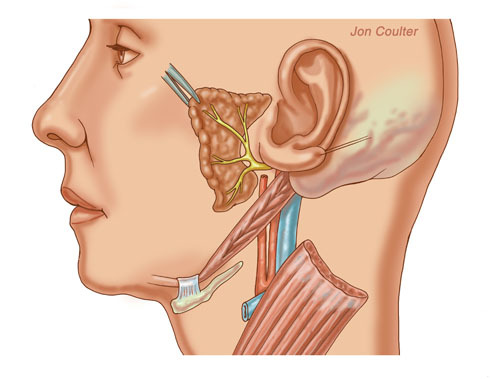 This is a test used to stimulate the nerve just below the ear and record a waveform generated by the facial muscle, called the CAP or compound action potential. The involved side is compared to the opposite side. The amplitude of the waveforms is compared. If the amplitude on the involved side is 90% of the uninvolved side, surgical decompression of the facial nerve may be helpful in hastening and improving facial nerve recovery. This illustration shows the location of the facial nerve in the face. A normal nerve is shown, as well as a compressed nerve between two portions of bone, and a decompressed nerve where the bone has been scaled back to make room for the nerve. 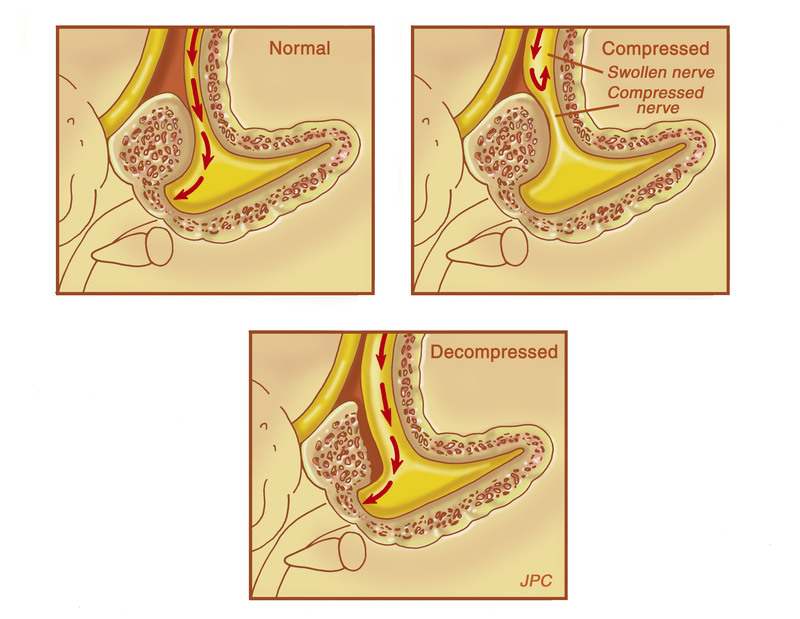 Middle fossa facial nerve decompression involves general anesthesia. A lumbar drain is inserted in the back to exacuate some spinal fluid and allow brain relaxation. An incision is made above the ear, and the bone over the brain is removed. This bone is placed back at the end of the operation. The floor of the brain is referred to as the base of the skull. The bone over the facial nerve is removed allowing room for the inflamed nerve to expand. Surgery more than three weeks after onset of paralysis may not be helpful in improving facial nerve recovery.